"This is a cold frosty sweet dream of a drink...for adults only!" 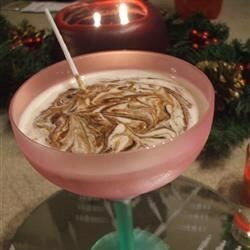 In a blender, mix the milk, coffee flavored liqueur, amaretto liqueur, and chocolate flavored syrup. Mix in ice cream, and gradually blend in the ice. If mixture is too thin, add more ice cream. Or if mixture gets too thick, add more milk or liqueur. Pour into tall glasses, grab 2 straws, and enjoy. Wow - this is a dessert in a glass! Tasted like an adult, almond milkshake. If you like the flavour of amaretto then this is a recipe for you.